Sharpen those no. 2 pencils, it’s tax time. The greatest part about a home loan is the home. Face it not many of us look forward to that monthly mortgage bill. Home lenders will alway’s state “well you can’t write off the mortgage interest” and you SHOULD. There are varying policies and requirements when it comes to a refinancing loan on a cash paid property, $1 million caps, and more tax rules, so we advise you to do your homework before writing anything off. We understand owning a home and having a family is an expensive feat within today’s economy. Maybe your finances were affected by the housing bubble, job market, or merely bad luck, it’s ok. So a lot of people utilize a Home Improvement Loan. The great news about this loan is the loan interest is tax deductible!! There’s no upper dollar limit, but the project must increase your home’s value and prolong its life. Examples: A new roof, pool, garage, porches, insulation, HVAC, landscaping, and more. We strongly advise you to reconsider increasing the square footage of your home, unless you’re prepared for possible reassessment (higher property taxes). Home Improvement loans can help you increase your home’s value! We’ve known about these since our day’s playing Monopoly. Your city or state property taxes can be deducted from income. Keep in mind that city or state property taxes refund reduces your federal deduction by a like amount. Do you run an ETSY store or EBAY shop? As long as use a portion of your home exclusively for business purposes, you may be able to recoup certain home costs. We do recommend making sure your homeowner’s insurance policy will cover your house if you do have a home business (double check). A great video showcasing this was in the movie “The Accountant” here’s the scene. 99 inches of snow and counting! The midwest strikes again! Polar Vortex 2.0? What’s the snow mean for roofing? Every person throughout the construction industry heard rumors regarding the upcoming winter of 2015! Everyone was prepared after the winter of 2014. People upgraded their snow plow systems, stock piled salt, purchased roof rakes, and seeked parking lot contracts. The chance of another polar vortex meant potential jobs. Preparation is often central to a weather haymaker, especially when the weather bible aka “the farmers almanac” predicts a repeat. Well, the construction industry should be happy to a degree. Because the best economy booster is often Mother Nature. Especially in the roofing industry. Recent years, a brand new industry has evolved such as storm chasers. Individuals so well tuned with insurance fine print that even your “friendly neighbor” cringes. These serviceman are the first to knock after a catastrophic or even minor storms. Masters of door-to-door marketing and extremely competitive in the roofing marketplace. Often they are the first people you see after experiencing damage without picking up your phone. These companies vary in quality, some are great and others unethical, but which industry doesn’t follow suite? What’s this mean? Why don’t we consider snow to be as much as nusicance as hail? We call our local contractor or the guys driving bright, logo trucks after the latest rain storm or hail. Why, don’t we do the same after a midwestern winter? 20 inches of snow sitting on your roof is damaging to all your products: roofing shingles, deck, underlayment, drywall, insulation, heating bill, and more. The thing about snow too is that it could sit on your roof for awhile, whereas a hail storm comes and goes. A week of water isolated on the top of everything you own is not smart potatoes. Many homeowners would mention “well we have lifetime shingles.” I agree you purchased a quality shingle and it could last 30 years. However, did you research whether the thickness of snow for a prolong period will affect the product? Shingle specs are built off isolated studies and years of “trial & error.” It’s difficult to state whether those studies were put together based off winters that brought forth 20 inces & more, year after year. Weather is key to exterior products existence. Without the harsh weather we could live in the elements and lack appropiate shelter. The snow created plenty of construction products: insulation, ice pelts, ice & water underlayment, synthetics, & metal products that protect to date. Ultimately we constumer have changed our attitude towards a homes. Recently, our industry has noted weather damage is a good thing, because that’s business for many. However, a loss for a gain is not right. Roofing started as a way to cover one from shelter. Shelter means survival, which means why aren’t we more proactive with things that should eliminate stress inducers than make them the actual stress inducers. The purpose of this post is ultimately to let you know that you NEED TO BE PROACTIVE with your house after this blizzard. Make a checklist of things to fix, change, or improve around the house. Don’t call your insurance because you have issues that could’ve been avoided with proper care and preparation. Take responsibility of your home, unless it’s a house (they are different). Familariize yourself with upcoming products, building codes, and ways to make your house more valuable. The internet is the most powerful learning tool. Mayber you don’t know where to go? Check out our facebook because we often post tips and videos that you could DIY. Give your house love and it becomes a home. If your car needs an oil change you get it, hair long you cut it, and if you want to play sports you get a physical. Proper prepartion is the key to coming out of the winter 2015 with a few stratches or entering it with a lot of surgeries. Sure, at Total Roofing and Construction we love open-roof surgery, but you shouldn’t. We are here to assist and solve problems not pray for them. Recently, it’s been brought to our attention that a roofing commercial has crossed the line of no return. This commerical combines the influence of the adult industry along with the daily job of a roofing salesman (one second of the video and you’ll understand). We’ve seen the commercial and as a roofer we agree it’s pretty funny, but as a business we want to know what this company was thinking. Thank goodness for children this company decided to toss the idea out last-minute. We’ll never know the commericals success or whether BBF roofing really fixed the roof. However as outlandish this video appears it brought up an excellent topic. 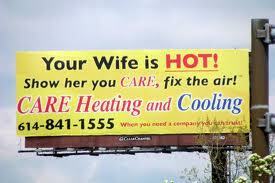 Advertising in the roofing industry. We’d love to tag the video link, but it’s slightly inappropiate. If curious type on Youtube “roofing commericals” and it’ll be BBF Roofing Commercial. It appears our industry deters companies from differentiating their advertising method’s from competitors. It’s almost applauded to follow competitors and continue traditional methods such as direct-mail outs, billboards, radio segments, door-2-door, booths, and sponsorships. These forms still work or else no one would actively pursue them. Yet, after years of monitoring the industry it seems each competitor stick to the same things, but with a different font. We don’t believe choosing italics over bold will double your ROI with that mail-out, but they might (says company marketer). The more our marketplace is defined by these age-old tactics the more we realize this crazy commercial may solve a lingering issue. A recent game-changing ad by an Air Conditioning company. Some believe successful advertising is making people talk about your product even if its bad publicity hence Miley Cyrus’s latest antics. As many family business know its difficult to compete with organizations that steep to outlandish tactic’s to draw consumers. So after years of fighting the current we’re finally jumping on board. It’s official that Total Roofing & Construction will be adding their first pond in this unorthodox game. 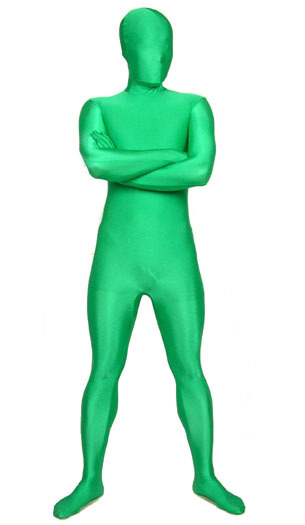 We will be announcing the hiring of Green Man to Total Roofing & Construction team. Upon a thorough interview process we believe its in the best interest of the company. Distinguished himself and blew away his competitors during the Q &A process. He was extremely charismatic, appeared humble, & held tremendous eye-contact. We hope to upload his interview after he consent’s to it. It’s the best interview our panel has witnessed first-hand and believe he’ll help our organization grow not only in the green direction, but also the right one. This means we’re going to avoid making artificial claims such as giving a free roof away (read the fine print here), hire models to work our booths (statistically this does work), or as BBF roofing showed make adult-oriented commercials (which may actually have hit their target market). We believe roofing advertising will begin changing drastically, but in today’s world you either jump on board or sink.